The Nobel laureate draws on the Old Testament to produce a fable that could end up uniting Christians, Jews, and Muslims in protest over this slim novel, something the most powerful nations in the world have been unable to do – ever. It’s heretical and hysterical, blasphemous and boisterous; it’s a new twist on an old story with over 2000 years of fallout, some imagination, and an author unafraid of stepping over the line. 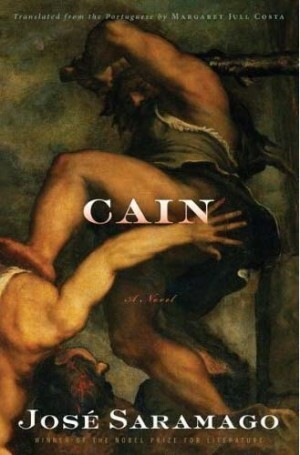 Cain is infamous for the murder of his brother, Abel. In Saramago’s version, God then appears to Cain, and is drawn into a debate over his complicity in the murder. God admits some guilt, but asks Cain to not “tell anyone, it will be a secret between god (sic) and cain . . .” God marks Cain’s forehead, a “sign that for the whole of your life you will be subject to my protection and to my censure too . . .” Cain is then sent off as a “fugitive and a vagabond . . .” to witness a few of the many significant events from the Old Testament. The sequence of events is altered to fit the narrative. Call that revisionist if you like; Saramago would probably applaud the accusation, and then go on about his day. Insouciance is a trait that he may share with his protagonist; they just don’t much care what others may think. Cain is somehow capable of time travel, bouncing back and forth between events that are out of sequence from the Old Testament. He is confused by that, but Saramago has lined up the events to grow in magnitude as the story progresses. Cain is there to save Isaac from being slain by his father, Abraham (the angel was late, so Cain had to step in). He also witnesses the destruction of the Tower of Babel; the destruction of Sodom and Gomorrah and Lot’s seduction by his daughters; and the massacre of thousands for the creation of the golden calf. The atrocities continue, growing in scope, until Cain is the last passenger to board the Ark just before God wipes out the human race with the flood. The biblical landscape was harsh, but not harsh enough to suit Saramago, who adds to that harshness through his prose. Conventional grammar and syntax are neglected in favor of run on sentences and uncapitilized proper nouns. The result is a poetic, almost stream of conciousness, rambling tale that is sometimes difficult to follow. It’s harsh and desolate, but a fitting complement to the tale. Cain condemns God repeatedly throughout his macabre journey. That may be a bit hypocritical for someone who killed his own brother, but his crime soon pales in comparison to God’s actions. His condemnation is based upon an assumption that God is omniscient and omnipotent, that he knows everything and can stop anything; his failure to do so leads Cain to the conclusion that “our god (sic), the creator of heaven and earth, is completely mad . . .” Cain is not afraid of God, and God never censures Cain as he warned him he would after Abel’s murder. Maybe it’s God’s way of confessing, expressing a sense of guilt by not censuring Cain. The perpetuation of the species is at the heart of Saramago’s tale. Humans are God’s playthings, and thousands die when they don’t do as he desires. That’s a tough price to pay for avarice, worshipping golden bovines, or just plain pleasure seeking. Cain eventually comes to the conclusion that God is “evil pure and simple,” and that God “hasn’t the slightest notion of what human justice might be . . .” That implies that Cain does have a notion of what human justice might be, which might be a bit of a stretch for someone who killed his brother in a fit of jealousy. But Cain has evolved during his journey, from a jealous brother to a righteous dude, and neither Cain nor Saramago let God off the hook for anything. Cain confesses that he longs for “what is usually called a normal life,” but in the end, he realizes he has a higher calling — saving mankind from God’s wrath. Saramago questions all concepts of God — omniscience, omnipotence, infallibility. His God is none of the above; his traits are more human than divine. Cain was first published in 2009 in Portugal, and has just recently made it to this country. Saramago died in 2010, off to meet his maker as some would say. Only he knows which direction he went, or if his reputation saved him from retribution; but saved or not, he left us with much to ponder.